The Nelson Street house in April of 2010. Please note: A significantly expanded version of this story appears in our book Haunted Marion, Ohio. Lisa (not her real name) says she grew up in a house haunted by the spirit of a man who died there. Of course, a lot of people are skeptical when they hear a claim like this. 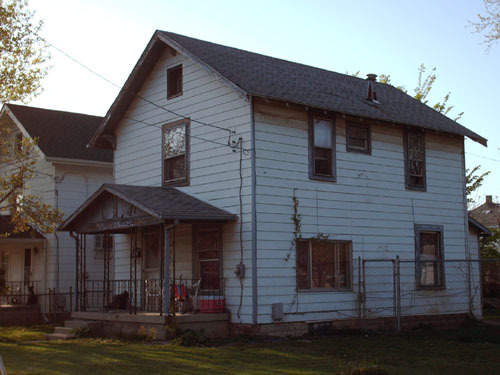 However, what makes Lisa’s story interesting – whether one believes it or not – is the fact that house, located on 770 Nelson Street , does have a history, and it’s not a pleasant one. The story really begins on Easter Sunday of 1960. Two girls, 18-year-old Virginia Napper and her younger sister, 15-year-old Edna Mae, creep up the stairs. Edna Mae has removed her shoes so as to make as little noise as possible. Their mother is cooking Easter dinner, and their father is sleeping in the upstairs bedroom. Ostensibly, the girls have gone upstairs to wake their father. Instead, Virginia loads a .22 caliber rifle, slips into her father’s bedroom and, with Edna Mae watching, points the muzzle at her father’s head. And then Virginia pulls the trigger. At first, police were puzzled by the girls’ actions. They both freely admitted to taking part in the killing, but their motive for wanting him dead wasn’t clear – at least initially. Marion City Police Chief Justin Cornely, in a statement to the Marion Star, said only that the girls’ father had “picked on them.” However, it soon became clear that Mr. Napper had done more than merely “pick on” his daughters. For her part, Lisa, who lived in the house until her family moved out in the mid 80s, says that the family was initially unaware of what had taken place there. It was only after other people told her parents about the Napper shooting that the family learned about the house’s history. As for the Napper girls, their fates were decided during the summer of 1960. On June 30th of that year, a jury deliberated just over three hours before finding Virginia not guilty by reason of insanity. This meant the teenager would have to enter the Lima state hospital for the criminally insane, though prosecutor Robert Stout suggested that a writ of habeas corpus could result in her complete freedom. Mr. Stout dropped the charges against Edna Mae altogether shortly after Virginia’s verdict was announced. This story is mind-blowing. It is about my mom. I am the daughter of Edna Mae Napper. I was born right after this happened in August, 1960. I remember that day. I went to school with Virginia. I lived very close to them. We were shocked. Virginia was always very quiet and kept to herself. I think she went on to get married and had a very lovely daughter. This message is to Betty. She had two daughters. Virginia is my aunt. Hey, whereabouts is that house on 770 Nelson St.? I’m from there but can’t remember where it is. I live in Fremont, Ohio now. Sonja, I lived catty cornered from this house for a little over a year with my 2 daughters and, oddly enough, that house was always empty. I had considered trying to rent it due to the size and the yard. Knowing the history now is kinda creepy. I do believe it’s the second house in from the alley on the north side of the street. My husband’s family now owns this house and have for as long as I can remember. We had no idea anything like this happened! Nice story for Halloween. Whoever wrote this should be ashamed of himself!! I was born and raised behind that house, and I was there that Easter Sunday. As for Ginny, Edna, Bill, Phil and Ms Napper…wonderful people! House Haunted? You got to be kidding!! Grow-up. That was years ago. Leave nice people alone. This sure was added to make a spooky story. Like I said, good Halloween story and that’s about all!! I also grew up a few houses away from that house and was there and remember that Easter Sunday very well. It was a very unfortunate situation and horrible for those two young girls. Is it really necessary to use their names? They still live in this community and have very loving children and grandchildren. I am sure this is something they would rather not have to address with their grand kids. The things some people will do to make a name for themselves or to make a buck are shameful and I say shame on you for using names!!! Is your closet clear of skeletons?! I lived in that house for a couple of years. Sold it in 1976 and moved out. My bedroom was the front one where they say the murder happened. I heard the story but never saw a ghost. I own that house and know all the story about the place. If I had been those girls and their mother, I would have killed him long before that happened. He was a terrible man. He brought another woman in and took her into the bed his wife slept in. I don’t know where everybody gets their information but somebody needs to get it straight before they start putting stuff out and they don’t know what they’re talking about. I thought the world of those girls and their mother and brothers. I live at 775, just across the street. The house now has a for sale sign in the yard. I saw a family looking at it the other day. Kinda spooky if you ask me. Oh please, it was just a story. Don’t believe everything you read. Whoever wrote this better get the facts right. I guess if you don’t like, you shouldn’t read it – great story!!! I live down the street on Waterloo. Every time I walk to Motomart I walk beside that house because the alley runs right past it. I always feel the need to look over my shoulder because I feel as if somebody is watching me in the upstairs side windows. It’s pretty awkward for me becuase I read this story a few years ago and it never happened utill I read this story. Kristine is my mom. I lived on Nelson on the corner by that house. I was like 11 years old. I remember pretty well and at the time my friend Kaycey lived there and we didn’t communicate with any ghosts, but we did see a figure of a man standing in the hallway. And yea not everything you read on the Internet is true. I grew up around and stayed at this house as a child. This house was not spooky, scary, or anything creepy. No one should be scared of that house. I grew up in that neighborhood, played football in that yard. My friend Gary lived there in the 80’s. He never mentioned anything weird. My cousin rented it a few years back, but she never mentioned anything.